The Hudson is an American classic. 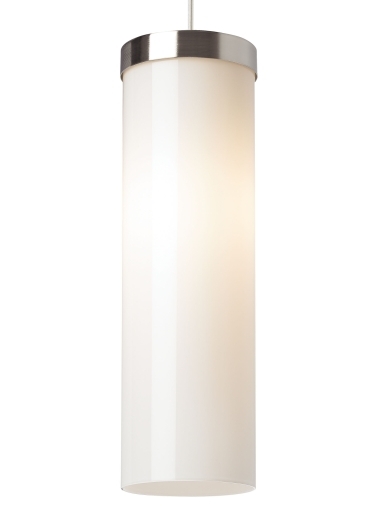 With a long cylindrical glass, and simple metal top from a round canopy, this pendant is perfect for kitchens, islands or business applications. This piece is meant to work with a variety of looks and decor. Black, satin nickel, and white finish options come standard with a satin nickel cap and clear cable; antique bronze finish with an antique bronze cap and brown cable. Includes 120 volt, 75 watt A19 medium base lamp or 32 watt GX24Q-3 base triple tube compact fluorescent lamp (electronic ballast included). Fixture is provided with six feet of field-cuttable cable. Incandescent version dimmable with standard incandescent dimmer. This product can mount to either a 4" square electrical box with round plaster ring or an octagon electrical box. Shown in satin nickel finish.